If it takes a village to raise one child, it's going to take many villages to support work that challenges and counteracts injustice in pregnancy, birth and postpartum today. The Educated Birth is committed to being a part of that. We do this in three ways: (1) gifting our own resources to qualifying individuals, (2) spreading awareness of these folks via our blog and social media, and (3) inviting others in the village to share and donate to these folks, too. Describe yourself. What are the most readily identified aspects of your personality, and what truths about yourself may surprise someone? I like to describe myself as typical but not so typical ambitious first generation Nigerian-American woman. I say not so typical because I am not exactly the stereotypical studious Nigerian who is determined to be wealthy with a high salary career. But typical because of my ambition and drive to reach what success looks like for me. I can be very stubborn and unmoving at times but always within the context of my best interests. I think it might surprise people that I enjoy being a loner because I have amazing friends and I am often in the community. It's opposite of what people expect from me but I feel that it keeps me grounded in this chaotic world and allows me to extend myself more in this work because of these boundaries. 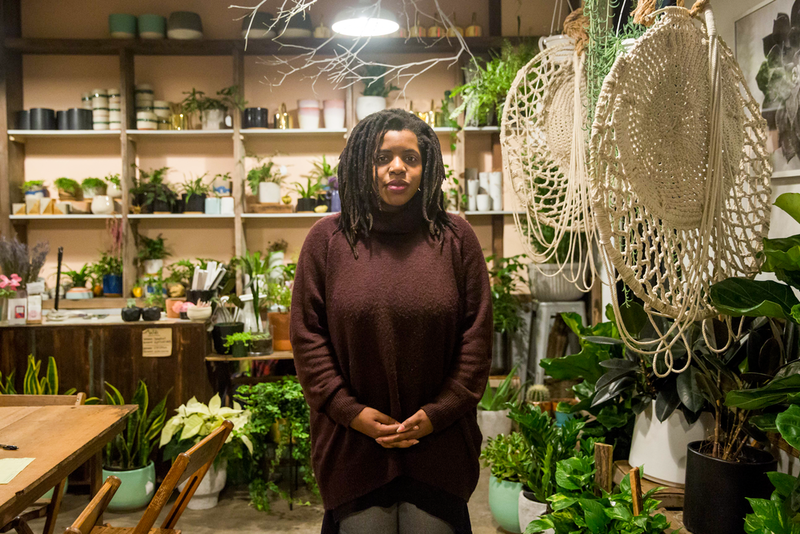 How do you pursue reproductive justice in your life and your work? I pursue reproductive justice as my life work by being a frontier of birth work. As a Doula I provided free to low cost birth, postpartum, abortion support, Child Birth Education and Lactation support to marginalized communities. 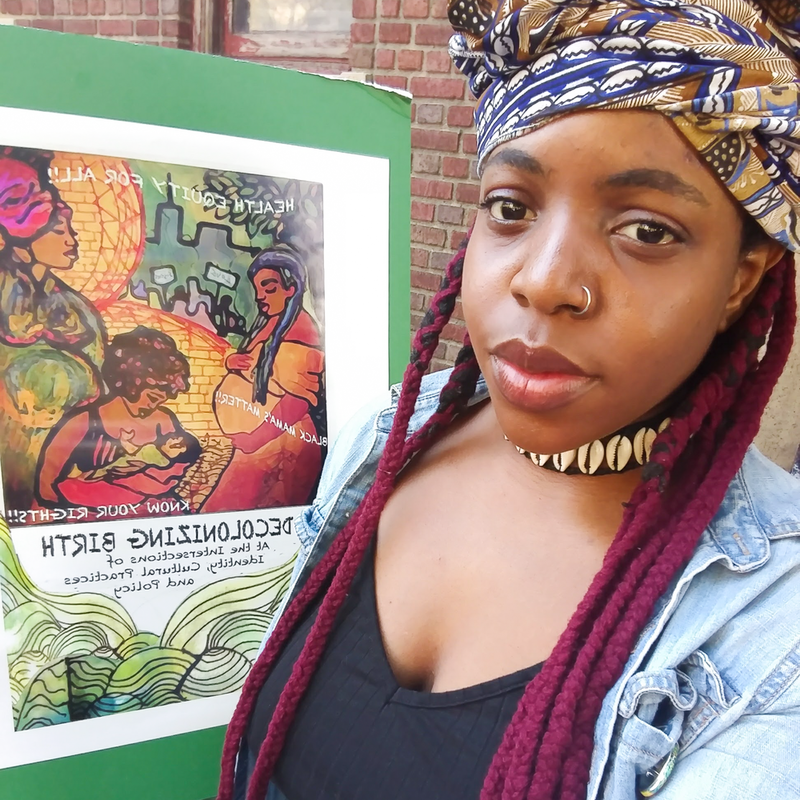 I worked as Managing Director/Assistant for Black women led organization where I organized a Decolonized Birth Conference, several free community events like Black Breastfeeding week block party, clothing/diaper drives and prenatal yoga. I was a member and employee of NYC Department of Health Sexual and Reproductive Justice community engagement group. And now I am advancing my birth worker career to becoming a Certified Professional Midwife to help address the lack of access to Black Midwives. Who has shaped you and/or what drives you to do the work you do? The black women in my life have shaped me and they also driven me to do this work. From my grandmother who was a Midwife in her village in Edo state in Nigeria, to my younger sister whose births inspired me, to mother and older sister who raised me, to my Nigerian aunties who always makes sure I am well, to the black women who trained me to be a birth worker, to my friends/kindred sisters who walk this walk with me and to the black women who were here before me who led the path for me to be here now. What are some things you do to take care of yourself as you pursue the work you do? Breathe. I can name dozens of self care techniques from face mask to aromatherapy but what works the most for me is breathing. In my yoga teacher training one of the required readings was The science of Breath and I learned about the importance of the breath on our physical and psychological health. Well right now I am currently in Midwifery school. I'm enrolled in an immersive one year program where I work in a Birth center for 500 hours per quarter (total of 4). That's not including being on call for clients that I provide full continuity of care for and academics class twice a week. A day in the clinic looks like a mix of several prenatal and postpartum exams, labor sits and assisting Midwives in a birth or me as a the primary midwife. If there is no birth and its a day of the week where I am in class I'll step out of the birth center and walk over to the school where academics is 3-4 hours and afterwards I'll return to the birth center. On a off day and I'm not on call im grocery shopping, doing laundry, running errands, doing homework and maybe sleeping lol. What areas of expertise do you have that folks should know about? Where do you see yourself and your work in a year, 5 years, 10 years? In the next five to ten years I see myself practicing midwifery in the states, Caribbeans and Africa. I want be a nomadic global midwife. I eventually want to open a birth center/ midwifery school in Nigeria. Do you have a donation page we can link to? We do this in three ways: (1) gifting our own resources to qualifying groups, (2) spreading awareness of these groups via our blog and social media, and (3) inviting others in the village to share and donate to these groups, too. Describe your organization. What should people know about who you are, why you started, who you reach, and what you’re doing in your community today? Abide Women's Health Services exists to improve birth outcomes in communities with the lowest quality of care. We started this organization because of the disparities in maternal and infant health among black women and because of the lack of equity in midwifery. We have a deep desire to see South Dallas and the southern part of Dallas revived. When you look at a map and you see nothing but red and you have the awareness that these communities are impacted on a systemic scale, then you can choose to just ignore it or choose to be part of the solution. Abide WHS strives to put forth solution based practices which require centering and amplifying the voices of woc. Our core values consist of Intrinsic Human Value, Human Flourishing, Reparations, Redemptive Justice, Racial Conciliation, Equity, Inventive Systems and Posture of Heart. These values are the fabric of our organization. We intend to seek the community to aid in guiding our practices as we train up midwives and educators who align with our values and mission. How does your organization promote the work of reproductive justice? For Abide WHS reproductive justice looks like considering the systems that impact women. Systems that do not support women. Systems that essentially kill women and their children even when they have chosen life for their unborn child. Abide recognized that justice is not justice when women fear death in bringing life into the world. Justice is not justice when the stress of racism causes hypertension and preterm birth. Justice is not justice when teens are shamed when they are pregnant and attempt to hide their pregnancies, justice is not justice when you lack access to culturally competent & anti-racist healthcare, justice is not justice when you fear your child will be killed by someone who's job is to serve and protect, justice is not justice when a community lacks access to healthy food and supplements to maintain a healthy pregnancy and justice is not justice when black women are lacking equity in healthcare. Abide WHS sees injustice and seeks to play a role in dismantling it. Take us behind the scenes. What does someone who reaches out to your organization get? You will be welcomed with a tremendous amount of respect and gratitude. We do not have a location as of yet but we are working on it. But I guarantee it will be unlike any other space in the metroplex. Those who reach out to us will receive compassionate, holistic, evidence based and culturally competent care. Welcome to the judgement free zone. Where do you see your org and your work in a year, 5 years, 10 years? Dreaming is what gets me excited. Our end goal includes having an Easy Access Clinic similar to the Jennie Joseph's model (if not replicated) and a Birth Center by year five. We want to see Abide replicated in communities across the country, similar to South Dallas, communities with the lowest quality of care. We want to be an example of racial conciliation and our hope is that it spreads and non people of color begin to not only get it but gain the understand that in order for us to improve health disparities within the black community, we must shift focus and put, as a dear friend recently stated, "their money where their thoughts and prayers are". I see more birth centers centering black women and woc, and I see more midwives choosing to reduce barriers that prevent black women from becoming midwives. What are ways that folks can support the work that you’re doing non-monetarily, and monetarily? Do you have a donation page we can link to? Donations can be made through our website at www.abidewomenshealth.org and through our Facebook page which will link to our paypal account. We also have an amazon wish list which is listed on our website as well. We are seeking supporters that will host small fundraisers in their homes. All that that would require is the host sending out an evite and providing a small meal for a small group of people (10-15ppl). This is the best way for us to connect with people face to face to grasp what we are trying to do and to establish long-term supporters of our efforts. We will also appreciate anyone interested in holding a diaper/baby clothing/maternity needs drive so that we can support our community in a tangible way. Those who have expertise in grant writing and fundraising are welcome to contact us as well.